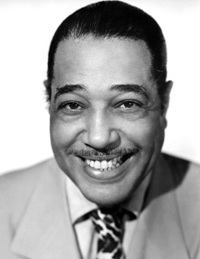 After its opening night, under the auspices of Chicago Opera Theater and the Chicago Jazz Orchestra, Duke Ellington’s late-in-life and largely unfinished street opera about a millionaire cosmetics queen in ’30s Harlem became the casualty of an electrical fire that has temporarily shut down the Harris. The delay will amount to little more than a footnote in the saga of infighting, frustrated restoration attempts and fraught Broadway dreams that have dogged “Queenie Pie” since Ellington’s death in 1974, leaving the question of the opera’s unfulfilled potential as much in limbo as ever. 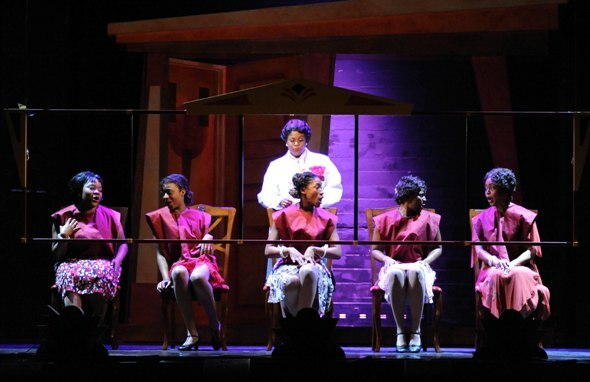 Despite a few tantalizing sketches and some opening numbers that vividly evoke Ellington’s beloved Harlem, “Queenie Pie” remains all but dead in the water theatrically. 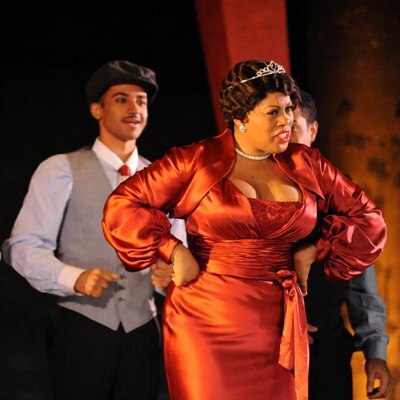 The current version, a co-production with Long Beach Opera, is certainly nothing that Duke, a consummate entertainer, would have put his stamp on despite the considerable effort of the enthusiastic cast led by Karen Marie Richardson, as Queenie, and the able singers, dancers and band members who gave it a go. Successful finishing jobs of this sort are extremely rare. How does a genius think, after all? Not that we would blame the COT team for trying. There are reasons to aspire: Mozart’s 18th-century Requiem, completed within months by the composer Franz Xaver Süssmayr, and Puccini’s 19th-century opera “Turandot,” which Franco Alfano finished, are major historical achievements. But the more we learn about the particular circumstances surrounding the gestation of “Queenie,” the longer the odds seem for anything similar on behalf of this 20th-century counterpart. Puccini died having written the music for “Turandot” well into the third act, with a complete libretto and 36 pages of sketches and short scores — the equivalent of band charts — as a guide to the rest. Compare that with “Queenie Pie,” which was extremely sketchy and from a highly experimental creative phase, demanding guesswork on all sides. 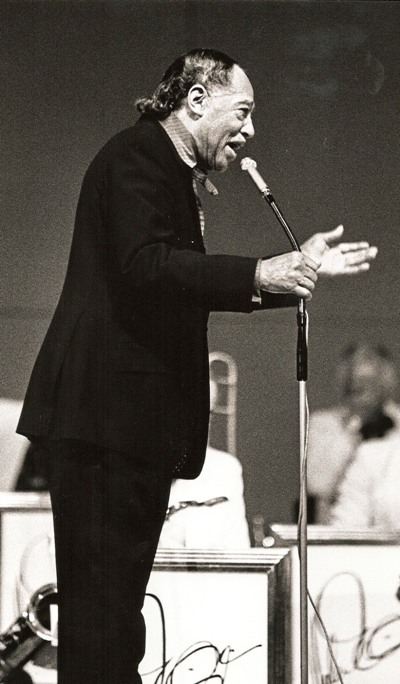 Ellington had been commissioned to write it for public television, but he also had other big projects in the fire, and “Queenie Pie” never made it completely out of the thinking stage and into that penultimate creative chaos — the heat of rehearsing and testing and refinement, feeding off the spontaneous energy of the soul mates in his band — that characterized his composition process. Where would Ellington have taken “Queenie” next? He died at 75. And as with any genius of immeasurable worth, there was quick litigation surrounding the right to interpret, and benefit from, those last creative strands. Enter Betty McGettigan, whose tale is extensively told in a 1981 report by the Washington Post’s Joseph McLellan and in the first chapter of a prospective novel that she shopped around after Ellington’s death. To read either account is to realize that McGettigan, now deceased, was a persistent and lively raconteur who did indeed spend a good deal of time with the Duke near his life’s end. The gist of the story is that she was a young, newly separated wife whose teenage son played French horn in the California Youth Symphony. Having cornered Jack Benny and secured his agreement to appear at a benefit to raise money for the orchestra, she pursued Ellington, too. According to McGettigan, Ellington was still working on it from the hospital, where lung cancer complicated by pneumonia took him in May, 1974. She told the Washington Post that she was the last person he spoke to, and that he wanted her to see the opera finished and produced. It was perhaps inevitable that McGettigan would apply for a co-authorship copyright in the course of trying to interest producers, and just as certain that a prolonged estate dispute would ensue. Ellington died without leaving a will. McLellan reported that Stanford University, producer Merv Griffen and the Houston Opera all pursued the project in the ’70s, but that all were put off by Ellington’s estate lawyers. It was Duke’s son Mercer Ellington who eventually received a 1983 producer grant from the National Endowment for the Arts to complete the work. The American Theater Music Festival, based in Philadelphia, presented this early posthumous version of “Queenie Pie” in 1986, with Mercer as production coordinator, Maurice Peress as music director, George C. Wolfe on the book and George David Weiss adapting the lyrics. The show also went to Washington, D.C., with Broadway producers flying in on spec and hopes initially high. The New York Times announced that a 2000 Broadway run was set, assuming extensive re-working, and that Patti LaBelle would star as Queenie, but nothing came of it. Nor did any of the other potential producers follow up after taking a closer look. Eventually, the project languished and even the orchestra parts were lost. Chicago Opera Theater has built an updated story by director-choreographer Ken Roht and applied new orchestrations by Chicago Jazz Orchestra artistic director Jeff Lindberg onto the unsteady foundation of these other attempts. 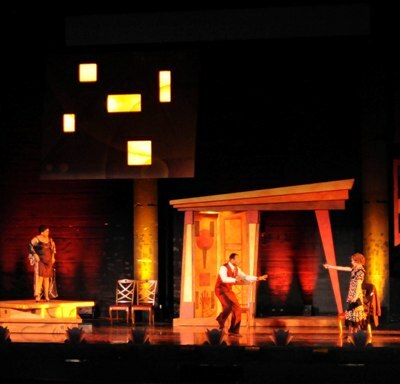 Within the last decade there is the 2008 version by hip-hop artist and playwright Tommy Shepherd (aka Emcee Soulati) and musical arranger Marc Bolin, who presented it in the spirit of a telecast, commercials and all, for Oakland Opera; and a 2009 mounting as part of an Ellington symposium at the University of Texas at Austin, which featured new arrangements by the UT Jazz Orchestra and a libretto completion by McGettigan herself. Yet the “Queenie” trail seems cold to me. The plot still makes no sense: Queenie is challenged by a younger, light-skinned beauty who battles Queenie in business, seduces and kills Queenie’s man, goes to prison for it and is later reunited with her on a remote, exotic island where all is forgiven. (Danila Korogodsky’s striking surrealistic sets cannot fix the leap of logic required.) As for the melodic material, there might have been an opportunity, shortly after Ellington’s death in 1974, that his virtuosic band men, who created music with him in a synergistic mind meld, could have done something more with his sketches, but in any case it did not happen. Ellington traveled the world, soaked up musical traditions, had a thousand ideas and created nearly as many works. There is no doubt that completing the commissioned opera occupied his last thoughts, and no reason to assume the category-blasting composer wasn’t headed toward something far more intriguing than what little he wrote. He simply ran out of time. “Queenie Pie” remains unfinished, beyond the reach of good intentions. Ellington’s death also marked the end of a remarkable era of TV cultural programming when NET was the nation’s non-profit broadcast network (the predecessor of PBS). Curtis W. Davis launched NET Playhouse in 1966-67 with broadcasts such as Tennessee Williams’ “Ten Blocks on the Camino Real” and Arthur Miller’s adaption of Ibsen’s “An Enemy of the People.” And it was Davis who helped NET form a partnership with CBC and BBC to produce The Opera Project, which involved each network taking responsibility for producing two operas a year, for a total of six to be shared by all. Ellington’s “Queenie Pie” was Davis’ last Opera Project commission. But by the ’70s, NET was a mere echo of itself, having tried the patience of politicians and of mainstream America with programming that was deemed too left-leaning, hard-hitting and elitist. NET lost crucial foundation support and was eased into a merger with New York’s local channel 13, which took its call letters and carried out whatever lingering NET programming momentum remained.